There is a paragraph style in Writer that just about every word processor has. These are lists, and they can be either bullets or numbers. Every word processor, from ones that work on desktop operating systems like Windows to those that run on Android and iOS, have this feature. Writer’s list features are some of the most robust, however. They can be found in the Formatting and Single Mode toolbars, Format menu, and the right-click menu. These toolbars have two icons for lists: Bullets List and Numbering List. Both have associated drop-down menus with them. This style is to be used when the order of the items in the list does not matter. If you want to start a new paragraph as a list, press the Return or Enter key on your keyboard and click this item in the toolbar. If you want to make the paragraph of text where your cursor is located, a bullet item simply click the icon. This will insert an indented bullet point in a new paragraph or make the current paragraph a bullet point. However, if you want a style other than the default one, click the arrow to the right of the icon. This will give you eight choices and a More Bullets link. Clicking one of these choices will add that style of bullet point in a new paragraph or to the current one. If the paragraph is already a bullet point, the style will be changed to the one you selected. 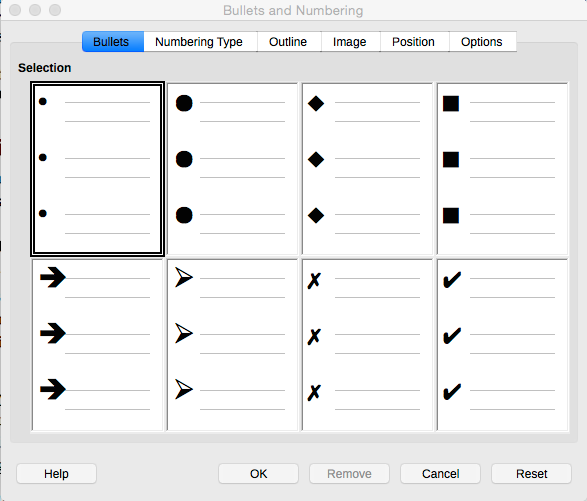 The More Bullets link opens the Bullets and Numbering dialog. This six-tab window has advanced settings for both bullets and numbers lists. It will be covered in the Bullets and Numbering section on this page. This is like the bullets list, except it is to be used when the order of the items in a list is important. If you want to make the paragraph of text where your cursor is located, a numbered item simply click the icon. This will insert an indented number 1 in a new paragraph or make the current paragraph point number 1. If you have two paragraphs that you want to make part of a numbered list, place your cursor in the first paragraph, then click the numbers icon. This will indent the paragraph and put a 1 in front of it. Then put the cursor in the paragraph below it and click the icon again. This paragraph becomes indented like the first one and a “2” is in front of it. The drop-down menu has eight choices. Clicking one of these choices will add that style of numbering in a new paragraph or to the current one. If the paragraph is already a number, the style will be changed to the one you selected. 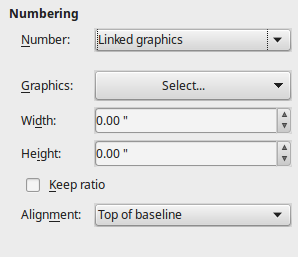 Clicking the More Numbering link launches the Bullets and Numbering dialog. rop-down menus for the Bullet List and the Numbers List, the Numbers and Bullet item in the Format menu, or the same item in the right-click menu. This tab has eight different styles of bullets. Clicking one selects it. Like the Bullets tab, this tab has eight number style choices. This gives you eight choices of a multilevel list, designed for outlines. The list can be a bullets list, a numbers list, or a combination of the two. asic bullet styles. Scroll through the list and choose the desired style. The Add and Resize button opens the Add Image dialog, which allows you to choose an image to use as a bullet point. Click the graphics that you want to use as bullets. If enabled, the graphics are inserted as links. If not enabled, the graphics are embedded into the document. This allows you to adjust the alignment for each level of the outline. There are 10 levels to choose from. You also can choose all the levels, 1-10. These choices are in the left column. After choosing the level, there are text boxes and drop-down boxes. The text boxes will only take positive numbers. They can take up to two decimal places. Aligned at: This text box lets you set the number of inches from the left margin where the bullet or number will be placed. Two digits after the decimal point are allowed. Numbering followed by: This lets you choose what follows the numbering: Tab stop, Space, and Nothing. Tab stop at: If you select a tab stop to follow the numbering, you can enter a non-negative value as the tab stop position. This adjusts the amount of spacing between the number and the first character in the point. Indent at: This text box allows you to set how far subsequent lines in each are indented. The first line is not indented. This tab allows you to set certain number styles for each of the 10 levels discussed in the previous section. It has the same left-column list, with 1 through 10 and a choice for all 10 levels. Select the desired level, then you have several choices. Number: There are 25 choices. Four of them are not numbering schemes. They are the following: None, Bullet, Graphics, and Linked Graphics. Depending on whether you choose one of these or one of the number styles affects what the rest of the items in the tab are. 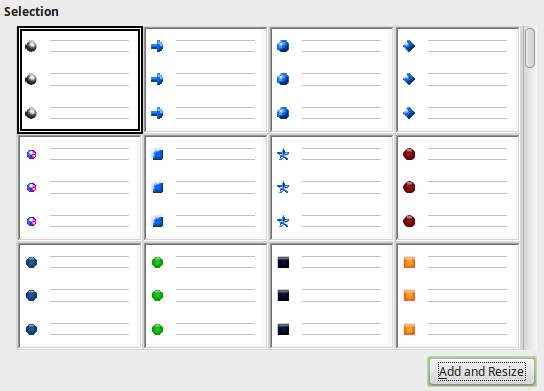 Character style: This drop-down menu has numerous choices based on common styles in LibreOffice. The styles depends on the operating systems that LibreOffice is installed on. 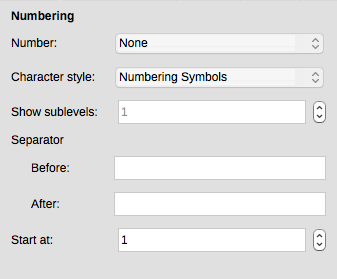 Show sublevels: This allows you to enter the number of previous levels to include in the numbering style. For example, if you enter “2” and the previous level uses the “A, B, C…” numbering style, the numbering scheme for the current level becomes: “A.1”.If you selected anything but level 1 in the left column, this text box becomes active. You can enter the number up to the corresponding level you have chosen in the left column. If you choose level 2 in the left column, then you can enter 1 or 2 in the Show sublevels text box. If you choose 10 in the left column, then you could enter 1-10 in the text box. Before: You can enter a symbol or character that comes before the number or bullet for each point. After: You can enter a symbol or character that comes after the number or bullet for each point. If the selection in Number is Bullet, the choices will be Character style and Character. Character: Clicking this button opens the special character. There are hundreds of special characters from different languages and standards. Click here for details about the Special character dialog. Graphics: This drop-down menu has two choices. From file: This opens the Link dialog that allows you to select a graphic or image from your computer’s file system. Gallery: There are special images for bullet points included with the LibreOffice installation. Highlighting Gallery opens a list with hundreds of images, showing a sample of the bullet along with where it is located. First select the level from the left column that you want to add the bullet graphic to. Then highlight the desired one and click it. After you click the OK button, the symbol will replace the previous bullet. If you want to apply the graphic to more than one level, select 1-10 in the left column. Width: This text box changes the width of the image you inserted. The changes are shown in the Preview box at the right side of the dialog. Type in the desired number of inches or use the up and down arrow buttons to change the width by .05 inches per click. Height: This text box changes the height of the image you inserted. The changes are shown in the Preview box at the right side of the dialog. Type in the desired number of inches or use the up and down arrow buttons to change the height by .05 inches per click. 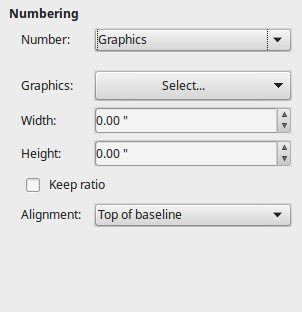 Keep ratio: Putting a check in this box keeps changes the height if you change the width or changes the width if you change the height so the image remains proportionate in size. Alignment: This drop-down menu has several choices. The Linked Graphics choice gets inserted as a link to the image file, rather than being embedded in the document. This is the only difference between it and the Graphics choice in the Number drop-down menu. Consecutive numbering: A check in this box, increases the numbering by one as you go down each level in the list hierarchy. For example, the item nested under the first item in a list would be “2”. The item nested under it would be “3.” The fourth item in the list is on the same level as the first item, but it would be “4.” This check box applies to any one of items in the Number drop-down list. The toolbar can be used to make several adjustments to your lists. Demote One Level: Clicking this button will move the point where the cursor is located down one level. This also can be accomplished by clicking the tab key on your keyboard. Promote One Level: Clicking this button will move the point where the cursor is located up one level. Demote One Level With Subpoints: Clicking this button will move the point where the cursor is located, and the points that are nested under it, down one level. The subpoints will remain subpoints. Promote One Level With Subpoints: Clicking this button will move the point where the cursor is located, and the points that are nested under it, up one level. The subpoints will remain subpoints. Move Down: Clicking this button will move the point, where the cursor is located, below the point, and any of its nested points, it is currently above. You also can press Ctrl+Alt+down arrow key on your keyboard to perform this. However, this may flip your screen image upside down. Move Up: Clicking this button will move the point, where the cursor is located, above the point, and any of its nested points, it is currently below. You also can press Ctrl+Alt+up arrow key on your keyboard to perform this. However, this may change your screen’s orientation instead. Move Down with Subpoints: Clicking this button will move the point, where the cursor is located, and all the points nested with in it below the point, and any of its nested points, it is currently above. Move Up with Subpoints: Clicking this button will move the point, where the cursor is located, and all the points nested with in it above the point, and any of its nested points, it is currently below. Insert Unnumbered Entry: If you have a numbered list, this will insert an unnumbered point. It can be moved to any level. It simply will not have a number or letter preceding it. This can be useful for combining two points. Restart Numbering: Clicking this item will start the number of a point, where the cursor is located, in a list at the beginning. For example, if the cursor is located at item number 10 in a list of 20, clicking this item will change it to 1 and renumber the following points, so they are 1-11. Bullets and Numbering: Clicking this item simply opens the Bullets and Numbering dialog that was discussed earlier in this page.